Renaming a large number of file is a very complex task if you don't have the right tool for it. Adobe Bridge is a tool that is more than a inter connector between the Adobe applications, it can also be used to organize and manage files. There is a feature called Batch Rename in Bridge which can be used to rename a large number of files instantly with a simple specification and the way we want the files to be renamed. First open the files you need to rename in Bridge. I opened a couple of image files having random names. Use the Last Used method for renaming if you have already done it a renaming of some kind. Default, that is you have to specify how the renaming must be done. String substitution is were we can rename a particular part of the file name that is common in all files. For now just select the default option. Then you have the option to save the renamed files in the same folder or copy it in a different directory or move it to a different directory. Choose the option that is appropriate. Here is how you decide how the file names must be. You can add parts of the file name, here i have added four parts. 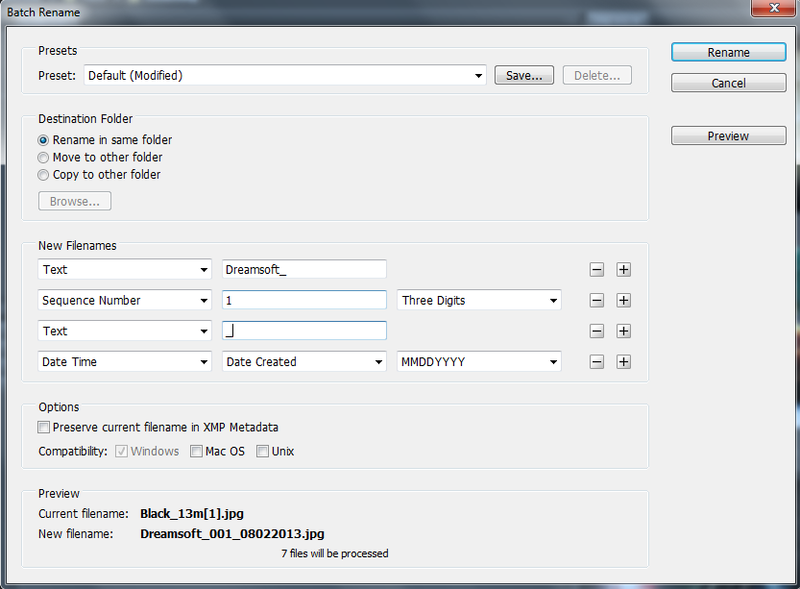 The Text part lets you add text, i have added the text Dreamsoft. The Sequence Number adds the number to images starting from 1 to the number of images so i have added that too, next i have added a text again to separate the sequence number and the next part. Finally i have added a Date Time part. You can add more parts or remove them by using the + and - symbols at the side. 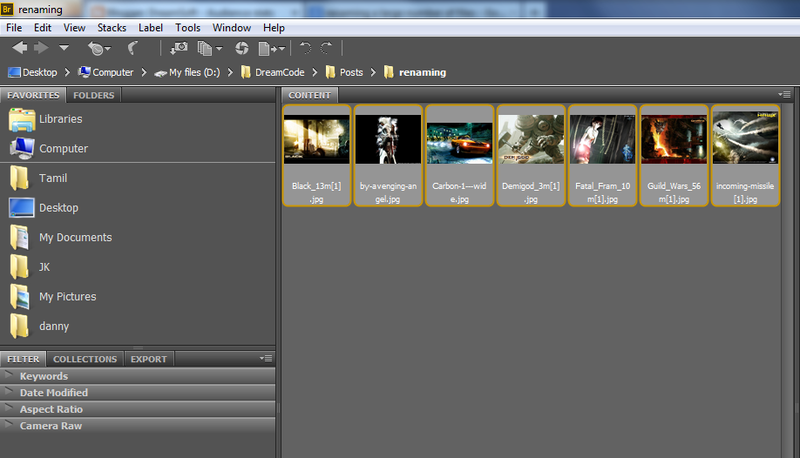 The preview of how the file names would look will be show to you at the bottom. 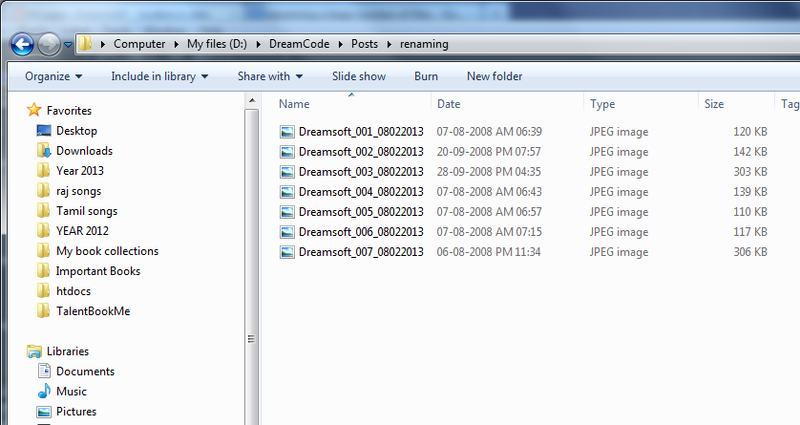 Here is the image of the files i opened after renamed with bridge. When choosing the file renaming parts you can preview how your files will be renamed in the preview section below. Choose the operating system that you are currently doing the operation for best results. Since i am using Windows i have choose window option.